Just as the seasons change so does life in the City of Cote Saint-Luc and at our City Hall. After ten incredible years at the helm, our esteemed mayor has accomplished a lifelong dream and has taken on the title of Member of Parliament. We are so fortunate as he will continue to serve us with integrity and passion and determination, now as our Man in Ottawa! I was honoured to join several Members of Council, our outgoing M.P. Professor Irwin Cotler, and several Cote Saint-Lucers at the official Swearing In Ceremony on Parliament Hill a few weeks ago. It was an extraordinary day, steeped in Canadian tradition and history that will long be remembered. Please join me in congratulating the Honourable Anthony Housefather, M.P. for Mount Royal and wishing him every success in his service to our constituency and our country. In the interim I have stepped up to lead the city as Acting Mayor. I have been working hand in hand with the Members of Council and the Administration to ensure a smooth transition as we prepare for winter, build our 2016 budget and get ready to elect a new mayor in an upcoming byelection. I am also excited to be celebrating 25 years since I was first elected to this venerable council, together with my friends and colleagues Councillors Mitchell Brownstein, Ruth Kovac and Dida Berku. It is truly an honour as I consider being elected to serve the public as a great privilege. I congratulate my colleagues on this important milestone in our political lives. I also note the long and distinguished service of Councillor Allan J. Levine who has served, remarkably since 1986. As for Councillors Steven Erdelyi, Mike Cohen and Sam Goldbloom, our youngsters on council, they have deeply devoted themselves for the last 10 years. All together, we have worked collaboratively and respectfully, for which I am very grateful. We have a dedicated and talented group of councillors here in Cote Saint-Luc, along with a dynamic and creative administration and staff led by Tanya Abramovitch, Nadia Di Furia and Jonathan Shecter, all of whom are focused on delivering quality services and programs to our residents. In addition we have hundreds of incredible volunteers who give of themselves, tirelessly, all for the benefit of our city and its residents. In the meantime, as the seasons roll over, I invite you to enjoy all our city has to offer throughout the winter months. Our Aquatic and Community Centre is bursting with activity seven days a week. Whether its for a dip in the pool or shooting hoops or taking an art class drop by and get active. The CSL Public Library is open every day of the year and offers so much for every age. Whether you prefer to skate indoors at the arena or at one of the outdoor rinks or go for a brisk walk along one of our park paths we take this opportunity to wish you a safe, healthy and maybe even a warm winter. Safe travels to our snowbirds. And please stay in touch with your city all year long. 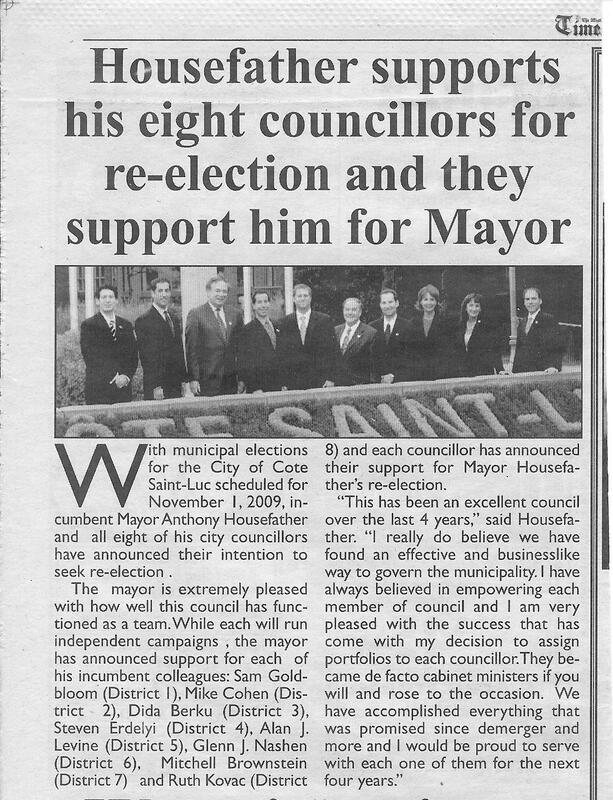 Subscribe to the Cote Saint-Luc newsletter at www.cotesaintluc.org/subscribe. Also CSL Alert allows you to receive notifications about events that may affect your home or neighbourhood via phone call, text message and e-mail. Visit www.cotesaintluc.org/alert to sign up. On behalf of the council, I take this opportunity to wish you a festive and bright Chanukah, a joyous and spirited Christmas and a healthy and happy New Year. The Westminster Avenue underpass in Côte St. Luc will be undergoing renovations. The councillor also said there were issues with the retaining wall, “both on the east and west sides. “On the east side, the concrete retaining wall is in need of a full facelift that will involve removing the top layer of concrete and adding a new layer onto it, at the same time keeping the width of the sidewalk standard so that people can still travel,” he explained. “It will also involve complete replacement of the guardrails. Erdelyi said he had been pushing for the project for several years, and that over time, the condition of the underpass worsened. Council regular Irving Itman has been calling for improvements to the underpass for years. 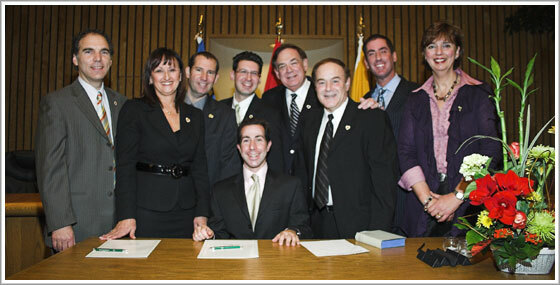 Mayor Anthony Housefather and all eight incumbent city councillors have announced their intention to seek re-election in the next Cote Saint-Luc municipal election. which will take place on November 3, 2013. 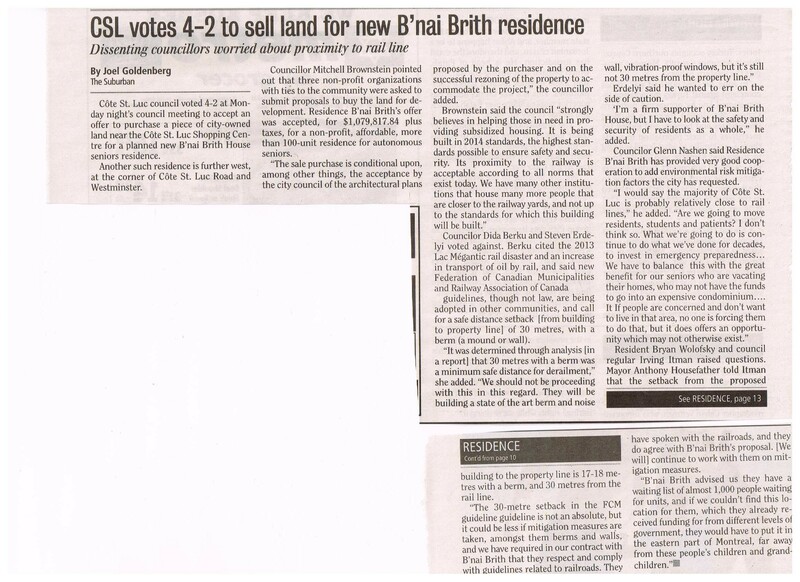 Councillors Sam Goldbloom (District 1), Mike Cohen (District 2), DidaBerku (District 3), Steven Erdelyi (District 4), Allan J. Levine (District 5), Glenn J. Nashen (District 6), Mitchell Brownstein (District 7) and Ruth Kovac (District 8) have all thrown their support behind the mayor. While each member of council will run their re-election campaigns independently, the mayor has announced support for each of his incumbent colleagues. “Dida Berku (District 3), emphasizes the mayor, has done a masterful job overseeing the city’s finance portfolio while also working diligently on matters related to the environment and the Cavendish Mall development and Meadowbrook. She also played a critical role in the introduction of a code of ethics in the city. “Dida’s legal and financial acumen and her incredible work ethic are invaluable for the city,” said the mayor. Glenn J. Nashen (District 6) continues to be a great advocate for public safety, always looking for new ways to make Côte Saint-Luc an even safer place in which to live. “Glenn has been a volunteer with our Emergency Medical Services organization for many years,” the mayor said. “He continues to oversee that dossier, in addition to our Public Security, Emergency Preparedness and the Volunteer Citizens on Patrol – an extraordinary service which was his idea. Glenn is constantly in touch with our local Police and Fire Departments, ensuring that matters of public safety are in good hands.” Nashen also heads up the Traffic Committee and CSL Cycles program, and he is always looking at new ideas to calm traffic, increase pedestrian safety and expand our cycling network. Free Press. Feb. 26, 2013. Click to enlarge. 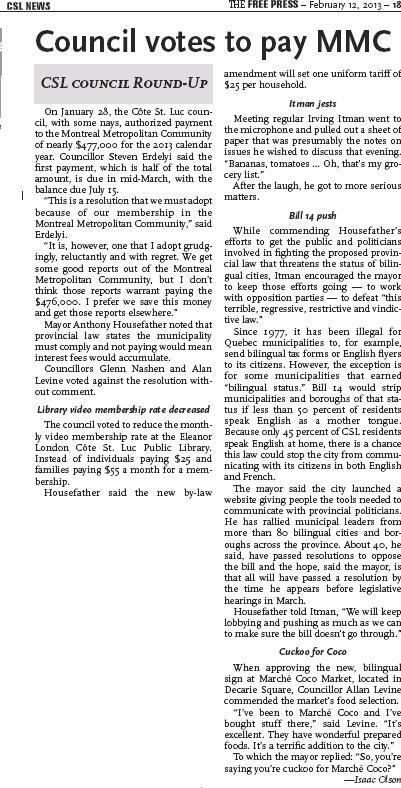 Cote Saint-Luc Councillor Steven Erdelyi gives an excellent summary of why we must oppose Bill 14 and actively campaign to defeat the proposed legislation. Free Press. Feb. 13, 2013. Click to enlarge. I have always voted against payments to the Metropolitan Community. Cote Saint-Luc derives very little value for its nearly half-million dollar annual expense. Of course, we are also bound by law to pay this amount and therefore have no choice. I feel it is better for this expense not to be adopted unanimously and for the public to be aware of how we are overburdened with multiple layers of regional government costing us in dollars, in bureaucracy and in confusing, complex and contradictory regulations and services. Quebec is the most heavily taxed territory in North America. This has an impact upon our economy, job creation and personal and corporate wealth. Do we really need to be spending $500,000 on the MMC?